Now that I am based primarily in Tasmania, it has been a pleasure to visit the cosmopolitan “mainland”, over the past few days. For example, I have just had a teatime chat with Dr. Dorothy Jones (b. New Zealand, based South of Sydney NSW; Jones writes on the links between postcolonial novels, needlework; she was a pioneer in gender studies 1970s-90s). Jones introduced me to some of the interesting critical concerns in the 2009 Joanne Turney publication entitled The Culture of Knitting [since 1970], ISBN 1 84520 592 8. Jones and I also spoke animatedly about the international Yarn Bombing and Knitted Graffiti ‘Craftivism’ movement! So, for my final response to the theme: Revivalist or Renegade, I ask the reader/other bloggers, Is ‘Soft’ Crochet Craftivism an effective public art ‘sub-culture’ strategy-for-social-change? Does craftivism work to achieve goals for the environmental movement, Tasmania’s primary concern-of-the-day? Many citizens in Northern Tassie have been garnering national, if not international, press by rallying against the nebulous processes of implementation and the negative impact of the proposed pulp mill by Gunns Ltd. Corporation on the ecology of the Tamar Valley. Some of my art students and craftivism colleagues have been involved either directly or tangentially. (see Banner photo image). Even though artist-designer Melanie Kershaw is a staff member of Tasmania’s Wood Design Centre , she wanted to speak out against the logging. We spoke at the end of November. She went about making a seemingly innocuous crocheted hand grenade object (shown here). 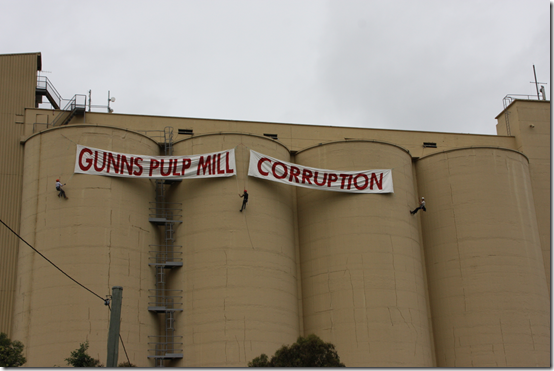 Kershaw said to me that she was responding to Melbourne Craft Cartel ‘s nation-wide ‘woollen weapon stockpile’ call (last August), which hopes to present a ‘vicious-yet-gentle and lovely’ community-engaged opposition statement to Gunns, as well as a Pro-Wilderness Society message. 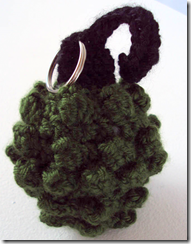 Visit Craft Cartel’s message to join “Save-The-World: Bang, Knit, Purl, KaPow!” campaign (fun, cartoonish tutorials included)! I like the medium of crochet, but I do not want to do knee-blankets, bed jackets and doylies… I learned this inherited skill from my mother and she learned from her mother…They used to sit around drinking tea calmly and talking about ‘the garden’ – how the roses are coming along and that sort-of-thing… But I wanted to do something meaningful; something contemporary in an ‘old-style’ medium. 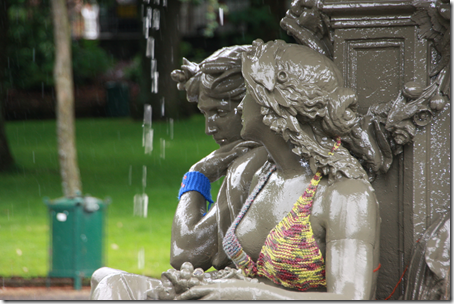 These two artworks operate in different genres, and that is ok. I was a bit jealous of Melanie’s last remark: an off-handed au-fait enjoyment in her practice and in her ‘right’ to indulge in either ‘high fine art’ or ‘low-political public art’ practice if and when she chooses. This would have been an ‘open-ended luxury’ that might have worried high-brow ‘Fine Art’ artists of my generation. Creating, and ‘going public,’ in two widely-differentiated genres would have entailed considerable deliberation in ‘serious’ women painter and sculptor predecessors who would have been aware that their ‘gendered’ idealistic or political pursuits and ‘crafted’ concerns could be critiqued and ‘read’ as superficially decorative (lacking a depth of integrity), fluffy, sentimental or, even, simply dismissed as ‘mad’. A hasty visit to the Victorian and Albert Museum website helps position contemporary craftivism in terms of nineteenth century progress. Under the search terms ‘Knitting and Crochet,’ the website has approximately 15 entries and an Acknowledgement section. 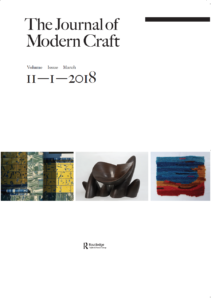 I reviewed ‘The Emergence of Crochet and Knitting in American Popular Culture from 1840 – 1876: The Hook and Book’ which links these crafts with the rise of Victorian ideals of ‘useful and silent’ femininity, and consumer, leisure culture (e.g. time freed up for more fanciful pursuits, because of the invention of the sewing machine in 1860, which made straightforward sewing and dressmaking less laboriously time-consuming). When I left Dr. Jone’s home, after tea about the text and textile arts links, I ran into ‘Grace’, outside the Art Gallery of NSW. Grace, who stated that she is ‘not necessarily an artist’, holds a quiet day job: – that of The Gallery Attendant of Kaldor Public Art Projects, Art Gallery of New South Wales – at the site Tatzu Nishi’s artwork, directly in front of the gallery. Grace responded to my question, ‘What are you knitting?’ by saying that she was a ‘Yarn Bomber!’ Grace was not concerned with the seeming obviousness of her task-at-hand: knitting. Grace was more concerned who she was – her identity as ‘a subversive avant gardist’, a Craftivist. Therefore, I ‘read’ Grace as an unintended ‘performance artist’ who had subversively inserted herself, as Actor/ Actress, into Nishi’s artwork, and, therefore, I saw her as a subversive ‘Craftivist’. She was certainly a part of my journey, as a viewer, into Tatzu Nishi’s two-part site-installation, entitled ‘War and peace and in-Between’, in which he re-shaped the large-scale figurative 1923 bronze (public art) sculptures by Gilbert Bayes: ‘The offerings of Peace’ and ‘The offerings of War.’ Grace was sitting at the entrance of one of the two ‘housing-boxes’ scaffolding. By ‘doing knitting’ Grace was ‘speaking to me’: her activity allowed me to re-think the position of the lowly paid female domestic in and amongst two large-scale male creations. Performing quietly in the corner, at the entrance to Nishi’s domestic, but grand, bedroom, Grace’s silent protest was made-visible by her craftivism. Nishi’s art already comments on the domestic versus public juxtaposition, together with his concept of ‘The Colonial Grand Narrative made post-colonial.’ Yet, in my eyes, Grace empowered his artwork by performing the miniature. Therefore, her subtle craftivism made her role-playing in-situ more outrageously symbolic against-the-presumed-social-order-of artworld policies and procedures. If artist Nishi is asking the viewer to imagine a ‘fresh’ perspective, I suggest he might want to take a leaf out of Vanessa Beecroft’s provocative portfolio and re-imagine ‘Grace’ (as legitimate Performer) in his and Baye’s “rightful” bedroom (Installation versus Sculpture-on-Pedestal) setting? At the same time, I would ask Grace to re-define herself, as Artist-Provocateur and both Careerist/Home-maker . I wonder where protest Craftivism will take contemporary art, when viewed, not only in ‘fun’, ‘youthful’ and ill-defined public settings by anonymous makers, but when Craftivism-for-social-change sets itself within high-brow contexts such as the seriously-minded ‘High Contemporary Art Practice’ at traditional museum locations around-the-world. Forbat, Sophie excerpt from 40 years: Kaldor Public Art Projects Art Gallery of NSW, ‘Bending Perceptions: Everyday Scenes turned into Surreal Experiences’ in ‘Look’, 12/09 – 01/10. Regarding Northern Ireland’s post-conflict shared future it befits my purposes here to share some historic links about trade unionism and cross-community social relations. The first Belfast female linen trade unionist was Saidie Patterson (1906 – 1985) who worked in the mills as a teenager and then, from 1960s – 80s as a peace activist, eventually winning 5 international peace awards before her death. She stated that making beautiful underwear and fine fancy domestic table and bed linens in the mills were all-very-well, but that the working class women from the Shankill (Protestant) and the Falls (Catholic) districts both came home from a day at the mill, exhausted and had to eat off of yesterday’s newspaper! The material culture that I “speak” through to recount the toll of the loss of life in Northern Ireland’s sectarianism has been The ‘fancy’ Irish Linen Handkerchief, which was central to the Edwardian Belfast economy and global trade for many years. Edwardian Belfast was the largest producer of linen goods in the world; about 80 companies manufacturing and exporting linen handkerchiefs in Belfast as late as 1911. (Unlike the luddites,) Lilley embraced machine work as an enhancement of production and design. The industrial textile industry survived on the employment of good designers such as Herbert and May Lilley who were also teachers of the art of embroidery. The Lilleys joined a firm of about a thousand workers. The 1910 Belfast art and design community claimed to be ‘non-sectarian’ and openly embraced the ‘non-political’ interest in the irish language and the Celtic myths and medieval illuminated manuscript imagery etc. while being influenced by the broader arts and crafts movement of the period (inspired by the writings of John Ruskin and William Morris). But Herbert Lilley adjusted the utopian socialist vision of ‘the hand-made’ to his own situation of being a designer-craftsman working in the obviously vast industrial complex of Belfast’s linen industrial stronghold. Northern Ireland’s flax farming and linen manufacturing system evolved from N. Ireland’s colonial relations with Britain and poor conditions for the factory and cottage-worker underclass. Herbert Lilley specifically worked on Handkerchief design in his career which spanned 1912 – 1950s) and was the subject of a recent retrospective and catalogue publication in Ulster. The ‘fancy Irish linen handkerchief’, as a domestic good, is held as precious within Irish cultural memory as a commemorative device and souvenir for a place or event, as well as an ideal Goodbye gift for the traveler. In the Irish Linen Memorial, the handkerchief (each with ten embroidered names of those killed and a spot of my sewn hair) is the central unit for the counter-monument. 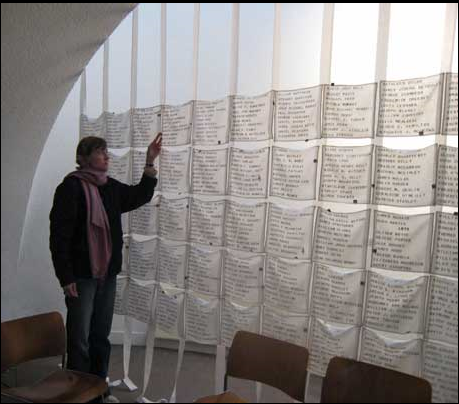 The Linen handkerchief Memorial was conceptualized in late 1999, after a chronological Names List was published of those killed in the sectarianism; — the sewing is finally finishing up these last two months of 2009. Please see www.linenmemorial.org ; included is the digitalization of the handkerchiefs for the website and a Names Reading soundscape. The (Irish) Linen Memorial has been completed thanks to 50 charity craftivists, concerned with anti-violence, peace and reconciliation and cross-community relations in Northern Ireland, after The Troubles. It was conceived in 1999, after I was working in Belfast’s inner-city, cross-community or interface neighbourhood and after I read Lost Lives, a published names list. Back in 1999, there was no neutral site for a traditional memorial for joint public mourning in Northern Ireland. Still today, in post-conflict N. Ireland, this idea is still problematic. Such an artwork-monument, while it contains a ‘neutral’ list of names of all those killed, chronologically, could/can possibly instigate further violence between persons/communities on either side of the political divide and that was/is not my intention. I hope Craftivism, as a movement, purports for ‘The Pitiful’ and ‘The Human’- in- art , as Paul Virilio, world renowned theorist on ‘Art and Fear ‘ and the de-humanising hyperviolence of TV imagery, reiterates. As an activist – craftivist, I am concerned about a sustainable environment and sustainable communities. I credit my colleagues who were involved in the civil rights movements of the 1960/70s with the fact that I am still making art today. Art historian Dr. Gloria Orenstein states that the links of contemporary arts with activism for the environment and egalitarianism is a return to the utopian dreamlike visions / imagery apparent in the paintings of the female surrealists, such as Leonora Carrington.